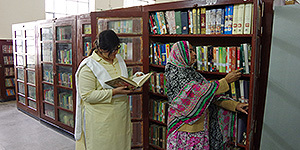 Library plays a pivotal role in the academic excellence of an institute. It is not just a store-house of books, it is a dynamic instrument of learning. The library of GSCWU is set up on these lines. It is a fine building with appropriately furnished twin halls providing an exemplary conducive atmosphere for reading. The library treasures over 22,000 books which not only support the courses on the curriculum but also include selective stock of advanced information and references. To keep the students in touch with the current affairs in the country and the world over, a goodly number of magazines, newspapers and periodicals are purchased on weekly, fortnightly and monthly basis. The library administration is responsible for efficient management of the library. The facility of online library service has also currently been made available. 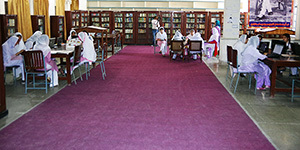 Moreover, the establishment of a research lab with computers and internet facility is a recent provision for the research scholars. This will give them access to researchers in other universities domestic or abroad.